East West Banking Corporation (EastWest) held its Dealers’ Appreciation Night recently at the luxurious Shangri-La at The Fort Hotel in honor of its Auto Loans Business partner dealers nationwide. Willy Tee Ten of Auto Hub Group receives the F1 Singapore Grand Prix Incentive Program Award from EastWest EVP & Consumer Lending Cluster Head Jacqueline S. Fernandez (left) and EastWest VP & Auto Loan Sales Head Jocelyn C. Legaspi (right). 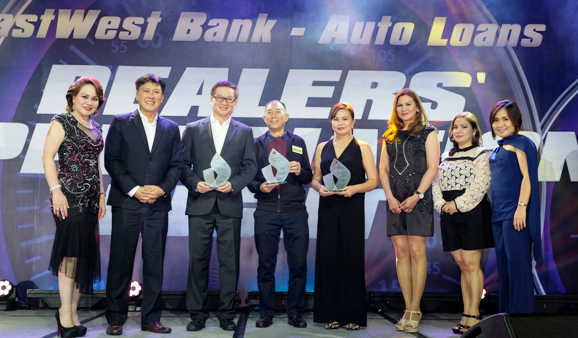 Now on its third consecutive year, the event is a glittering celebration that recognizes EastWest’s partner automotive dealers who have been pivotal in the phenomenal growth of the bank’s Auto Loans Business in the recent years. From left: EastWest EVP & Head of Consumer Lending Cluster Jacqueline S. Fernandez; Autohub Group executives Danny Chua and Willy Tee Ten; Gilbert Dee, Jr. of Union Motor Corp.; Toyota Pasig executives Jonalyn Lim, Connie Salang, and Marissa Operaña; and EastWest VP & Head of Auto Loan Sales Jocelyn C. Legaspi. The event was graced by dealer principals as well as top executives of various dealerships, and EastWest officers. In her appreciation speech, EastWest EVP and Consumer Lending Cluster Head Jacqueline S. Fernandez praised the bank’s dealer partners for their contributions to the auto industry as well as the economy. In 2016, vehicle sales rose by 25% to 359,572 units on the back of rising middle-class income, improving local economy, and the sustained low financing packages available, according to data from the Chamber of Automotive Manufacturers of the Philippines Inc. and the Truck Manufacturers Association. 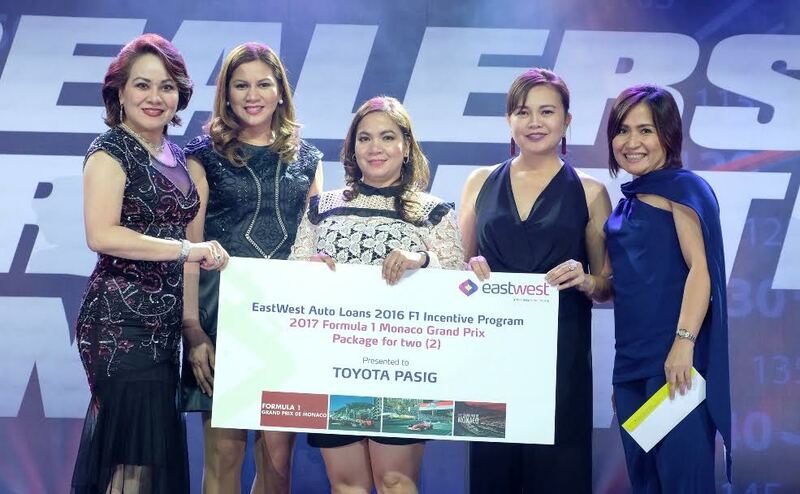 Toyota Pasig executives Connie Salang (2nd from left), Marissa Operaña (3rd) and Jonalyn Lim (4th) receive the F1 Monaco Grand Prix Incentive Program Award from EastWest EVP & Consumer Lending Cluster Head Jacqueline S. Fernandez (left) and EastWest VP & Auto Loan Sales Head Jocelyn C. Legaspi (right). The Association of Vehicle Importers and Distributors likewise reported an upward trend in sales from its members, posting a 77% increase as of the third quarter of 2016 versus the same period in 2015. 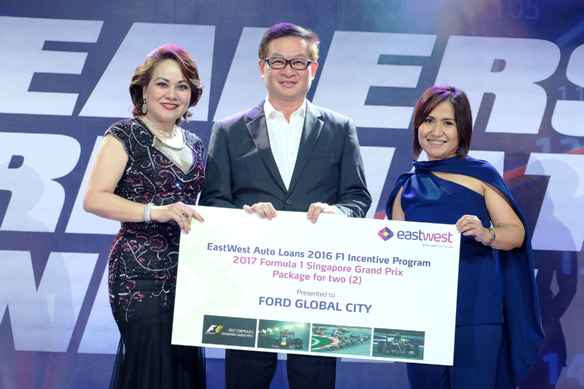 Fernandez also cited the crucial role of EastWest’s dealer partners in expanding the bank’s Auto Loan business. “We want to congratulate you for the exceptional growth of the auto industry which helped fuel our economy last year. 2016 was also another banner year for EastWest Auto Loans with an unprecedented growth of 67%. This year, let us continue to respond to the growing demand of the industry,” Fernandez said. EastWest’s Auto Loans performance matches that of the industry, growing at a compound annual rate of 47% over the course of 5 years. EastWest is currently the 4th largest in the industry in terms of auto loans coming from 8th spot five years ago. “We are confident that we can drive through the hurdles and achieve more milestones with the support of our automotive partners. We remain committed to serving the needs of our customers,” said EastWest VP and Auto Loans Sales Head Jocelyn C. Legaspi. Also during the event, the best-performing partner dealers were recognized with the Rookie of the Year Award, Quantum Leap Award, Top Dealer of the Year Award and Hall of Fame Award. Throughout the night, triathlete/celebrity endorser Matteo Guidicelli, first-rate dance group, the Hotlegs, and The Voice songstress Morissette Amon kept guests entertained with their exhilarating numbers. 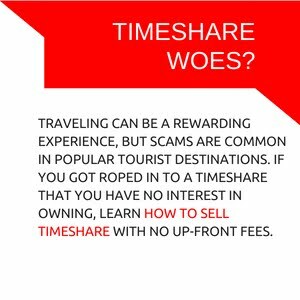 The night was filled with excitement as the latest devices and premium items like Sony Playstation 4, Apple Watch Series 2, Nintendo Xbox, GoPro Hero 5, Rimowa Luggage, iPhone 7 and Macbook Air 13 were raffled off to the guests. The event culminated with the awarding of travel packages for 2 persons each to experience the F1 Monaco and F1 Singapore Grand Prix as incentive for the top dealers. I want to warmth congratulate you for the outstanding growth of the auto industry. Auto loans business partner leaders play vital role in market, they provide much satisfied service to their customer. Always the stand with their customer even with customer demand car loan no down payment bad credit, Such a nice work. 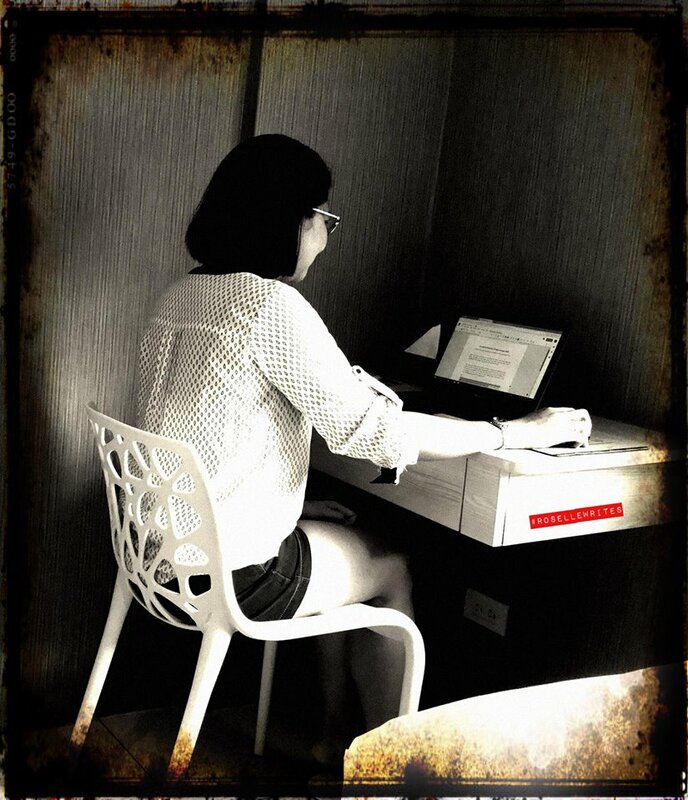 In the event that your auto got separate and you require some additional money Installment loan online for Bad Credit to fix it while your next payday is still weeks away then what you ought to do.